Laptops can only get so thin, and so to make them as thin as possible — to evolve them past the point where keys are needed — veteran computer maker has been rethinking the keyboard. The result is something very interesting, but is it good enough to use? First seen at IFA in Germany, the latest in Lenovo’s “Yoga” series is the “Yoga Book”, a $799 super slim machine that takes the innards of a computer and throws them into one of the thinnest builds you’re ever likely to see, measuring 4.05mm thin on one side and a little over 5mm on the other. We say “side” because there are two sides to this tablet, built like a standard clamshell laptop with a side incorporating the screen and some of the necessary computer parts, while the other side is another touch panel and the rest of the computer parts. So what are those computer parts? 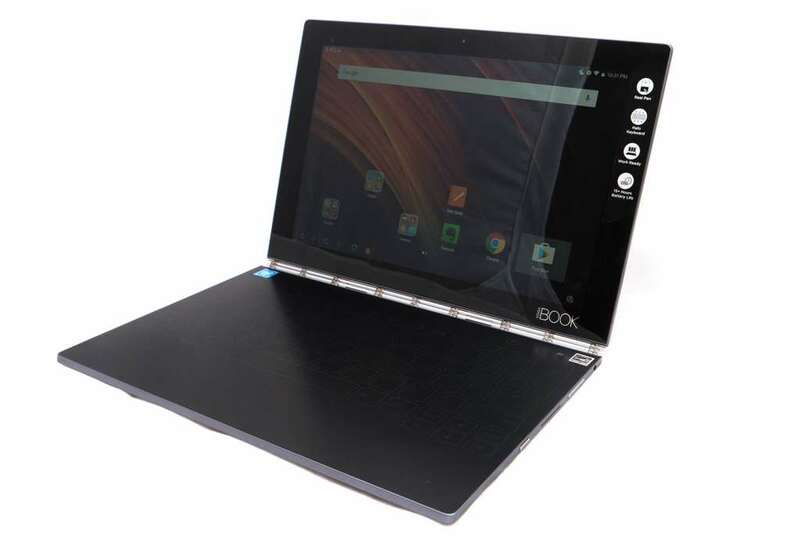 You’ll find an Intel Atom x5 (Z8550) processor here, operating at 1.44GHz standard and paired with 4GB RAM and 64GB storage, the latter of which can be upgraded using the microSD slot found on the unit, itself ejectable using a pin ejector tool. Cameras can be found here — tablets get them pretty standard these days — with an 8 megapixel rear camera, while the front-facing camera used for selfies and video conferencing is a 2 megapixel module. Connectivity options are pretty standard for a flagship device in 2016, too, offering Bluetooth, 802.11 a/b/g/n/ac WiFi, and both a microUSB and 3.5mm headset jack connector, as well as micro-HDMI port just in case you feel you need one of those. A fairly large 8500mAh battery can be found here, this despite that super slim size, and Lenovo is using a 10.1 inch 1920×1200 screen offering Full HD operation of Android 6.0 “Marshmallow” out of the box. Where it gets interesting is the input, with with that 10.1 inch display offering touchscreen support, while that second side of the tablet — the other section connected to the screen by way of Lenovo’s unique interlocking watchband-inspired hinge — relies on its own capacitive touchpad using electromagnetic resonance technology borrowed from Wacom, allowing you you write and draw on the same keypad. The Lenovo Yoga Book weighs 690 grams, and while our review unit arrived with Android, there is a Windows version that can be found. Seeing the Lenovo Yoga Book for the first time, it’s hard not to comment on the design because this is definitely something interesting. While most tablets out today are basically just a flat display of a device that offer a screen for you to take with you, the Yoga Book is clearly something more. 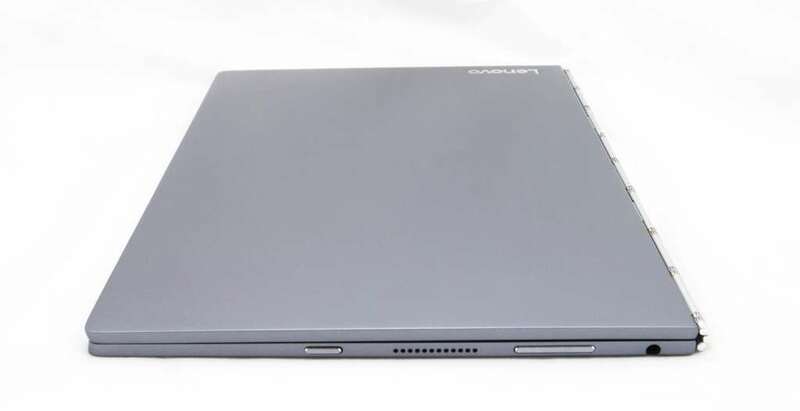 Connected to its second component by way of Lenovo’s unique metal hinge, this section effectively turns what would normally be a super slim and remarkably thin 4.05mm tablet into a more normal 9.6mm tablet with the keyboard already included free of charge. It’s not “free of charge”, mind you, as it’s part and parcel of the design, and you cannot remove it. Still, it’s an intriguing use of a tablet hinge, not just because it offers the 360 degree movement of the computer like you might expect to find on Lenovo’s other “Yoga” machines, but also because it really does look like a book when closed. 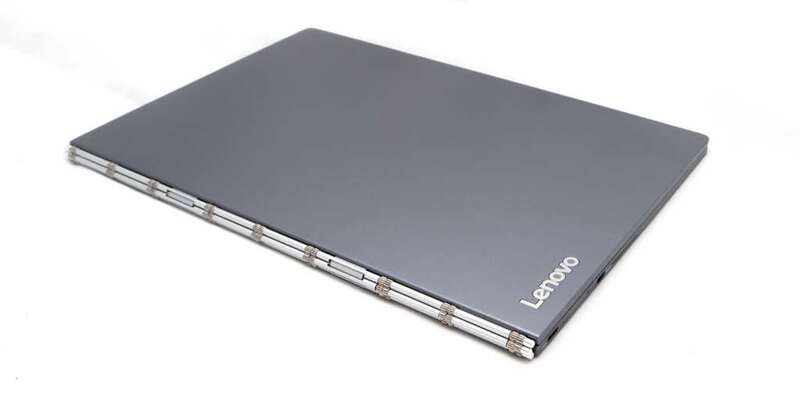 Imagine a metal book with a sleek hinge and you’ll have what Lenovo has crafted in this design, utilising a metal chassis made of aluminium and magnesium alloy for something equally strong and light that also happens to look sleek and modern, too. There’s no doubting this design from the outside. That super spesh watch-band inspired hinge from Lenovo. Sleek. Open it up and the style continues, with a really basic and minimalistic look that comes to life when you switch everything on, complete with the keyboard below. 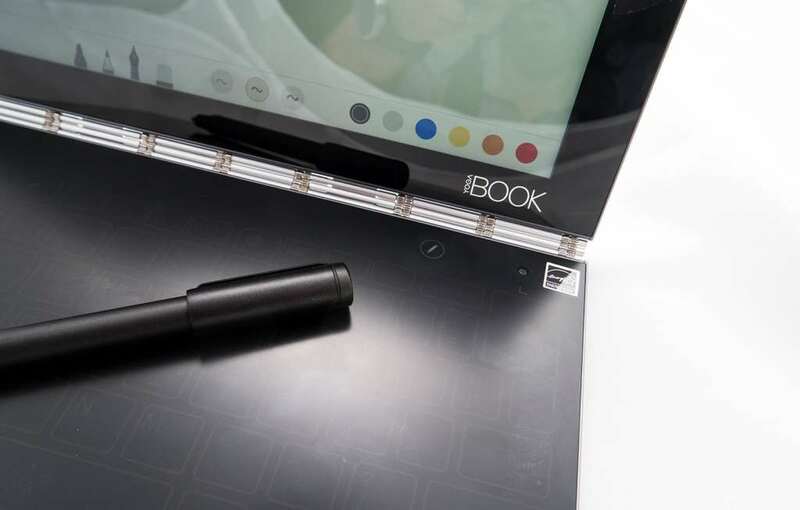 We’ll get into that part momentarily, but for the most part, it’s hard to fault Lenovo’s design, except perhaps in one area: opening the Yoga Book up. Going with such a sleek and simple design has its downsides, or “downside” as the case is with the Yoga Book, because with a flat edge along the front where you’re suppose to pry open the screen from its bottom section, “pry” is the exact word you’ll want to keep in mind. It’s not super easy or seamless, and we found we had to use two hands to do it, compared to the one almost every laptop requires, revealing the difference between a computer with a lip and one, well, without. Basically, don’t try opening the lid on the Yoga Book with one hand on a desk, as you’re more likely to push the machine off the surface of your table. We almost did several times. Switching the tablet on using the power button on right side (the same side as the volume button), you should see Android spring to life with a slightly different overlay to what you might be used to. 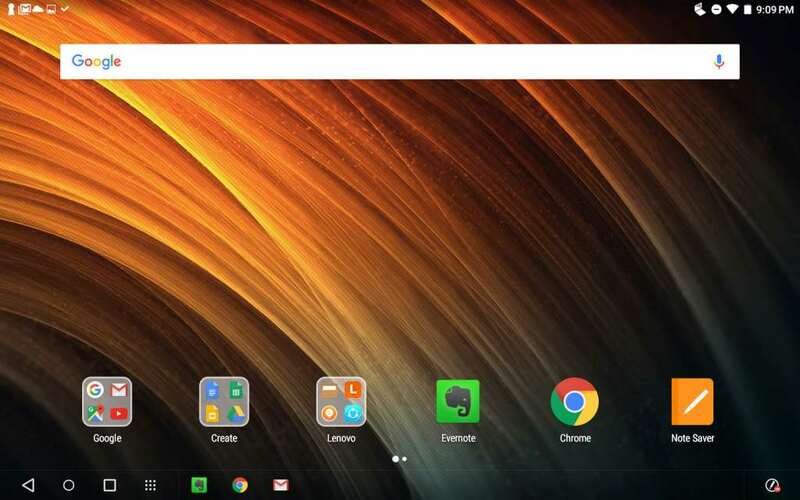 Lenovo hasn’t exactly reinvented the wheel with regards to what you see on Android, still providing multiple widgetised homescreens if that’s what you’re into, as well as an application menu you can search through. Really, it’s the little things, with the controls shifted all the way to the left side, a clearer drop down notification bar, and a bar at the bottom that isn’t just new to Android, it also emulates the taskbar of Windows, revealing icons of apps you have running. This brings a little more cohesion to the look and feel of Android, and is especially handy if you’ve never really played with an Android tablet before, which we’re sure a few people would certainly be in the boat of. Getting to use the tablet, you’ll find Intel’s Atom x5 does an admirable job with Android, though we’re not surprised given the amount of grunt the recent Atom chips hold inside. 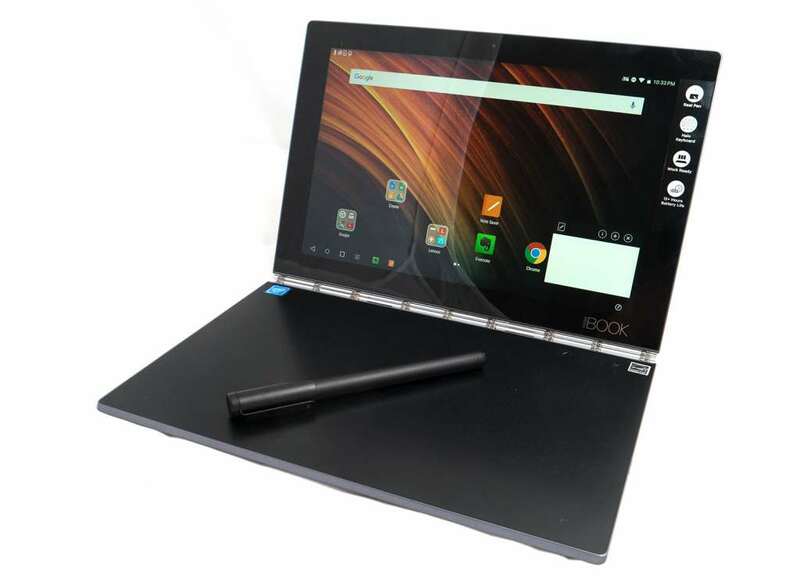 As a result, you should find the Yoga Book handles most of what you throw at it, from productivity to entertainment, though we did find some bugs in various applications here and there. For the most part, everything moves along swimmingly outside of these bugs, with Android not an issue on this system at all. But performance isn’t really the area we were ever going to struggle with, and Lenovo’s expert understanding of system building was always going to help it nail this area. 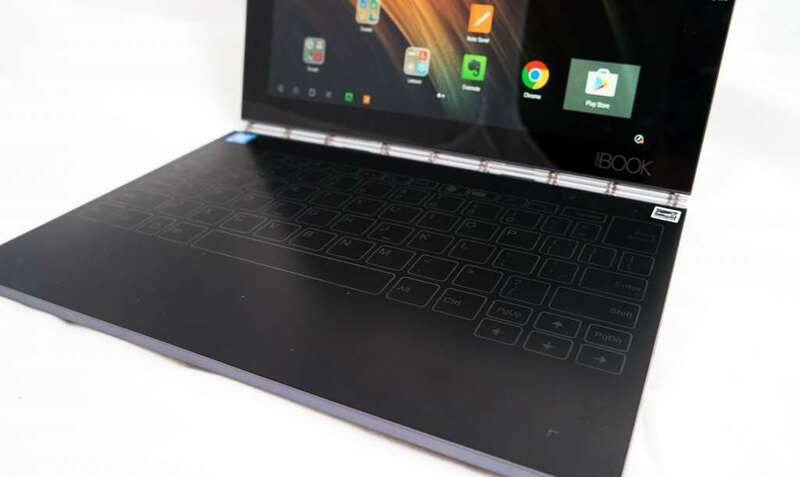 Rather, the keyboard on the Yoga Book — the other side that isn’t the 10.1 inch touchcreen — is the one place you need to really focus your attention on, because this is the area that shows off the Yoga Book’s new and amazing features: a keyboard built into the device offering a touch-sensitive set of keys that adapts to your finger placement. Glowing white when the keyboard mode is activated, Lenovo’s touch keyboard is easily one of the more curious inclusions in a computer or tablet to date, specifically because ir’s the first genuine attempt to make a touch keyboard into something you might want to use. Switching it on, the first thing you’ll come to see is that this keyboard offers no travel at all, and that’s because you’re using an entirely flat surface with the outlines of keys merely lighting up. This is even more of a touch keyboard than any we’ve seen prior, with the mostly retired Microsoft Surface Touch Cover and Apple’s Smart Keyboard for the iPad Pro not really holding a candle to how flat this keyboard appears to be. Rather, this is flat with lights glowing for the key spacing and letters and numbers. It is quite literally a light-up keyboard. And there’s a pretty good reason as to why Lenovo is offering a flat keyboard: instead of just solely offering the keyboard, the Yoga Book can switch off the keyboard touch panel and use the same surface for drawing and writing, employing electromagnetic resonance technology to let you draw or scribble when typing just won’t do. That’s all well and good if you want to take notes by hand or do a little drawing, but what if you want to write a paper or get some work done? It glows blue in this photo, but that’s just from a different white balance as we wanted to show the brightness of the keyboard. For that, you need to turn to the keyboard, and that’s where things may get a little touchy. Now keyboards are an area this particular reviewer happens to love, and is one of the areas that he will test heavily when reviewing a computer. 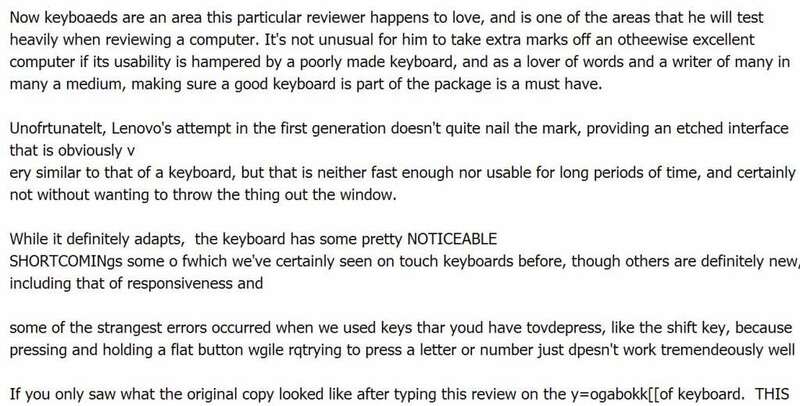 It’s not unusual for him to take extra marks off an otherwise excellent computer if the usability is hampered by a poorly made keyboard, and as a lover of words and a writer of many in multiple mediums, making sure a good keyboard is part of the package is a must have. Unfortunately, Lenovo’s attempt in the first generation Yoga Book just doesn’t cut it for us, providing a fairly decent amount of speed if you happen to be a fast typist, but also not adapting fast enough. For the purposes of the Yoga Book, “adapting” is apparently to change the size and relative key location inside software for where you’re fingers are trying to press, because without the outlines of physical keys, there are naturally going to be teething issues. Indeed, this reviewer struggled to adapt to Lenovo’s key placements, which aren’t helped by larger-than-normal sizes of some keys. while the adaptive keyboard just doesn’t adapt fast enough. Used to write half of this review, we stopped only when we realised our error rate was going through the roof, achieving insane results that made it impossible to tell what we were writing, prompting us to take a screenshot. We like keyboards, but this one just makes our error rate so frustratingly high. 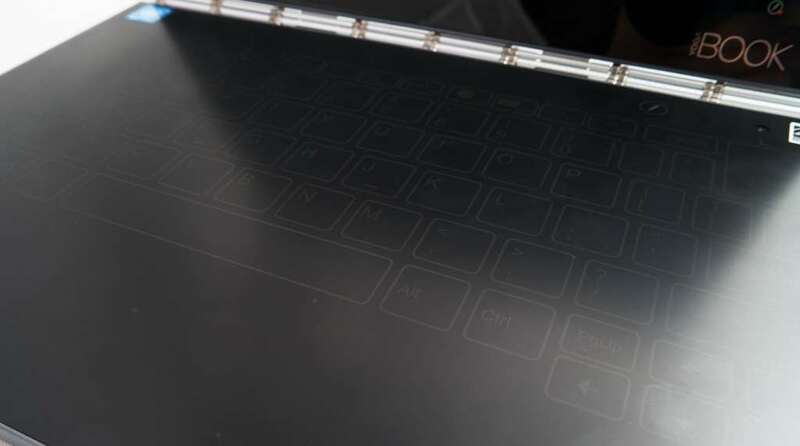 That’s the major issue with the Lenovo Yoga Book keyboard, because while the idea is good, the practicality just isn’t there yet, and if you love good keyboards, you’ll probably end up like us: six hours in and wanting to throw the keyboard out the window. If it didn’t connect to the display and could be removed, it probably wouldn’t be much of an issue. But that’s not the case, and instead you’re left with a rather curious attempt on the keyboard that just doesn’t pan out, and even goes a little further to confuse you, including flat home row bumps. Seriously, what is the point of a home row bump on the keyboard if you can’t feel the very thing meant to indicate that you’re touching home row? Fortunately, the pen and stylus on the tablet feels more like a saving grace than the keyboard, which needs a lot of work in its first generation. 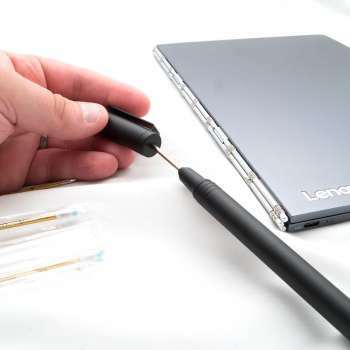 It’s probably a good thing that Lenovo has brought over the Wacom to make sure the stylus section works, skipping the need for a battery-based stylus, or even one that needs to charge at all. Instead, you get a pen… and what a neat pen it is. 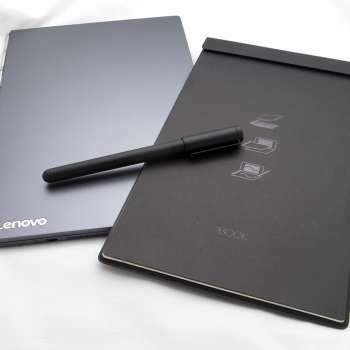 Utilising EMR technology — that’s the electromagnetic resonance tech we mentioned earlier — Lenovo’s Yoga Book looks for your use of the pen in proximity to the screen, which is why that double use keyboard section is permanently plugged into the tablet. 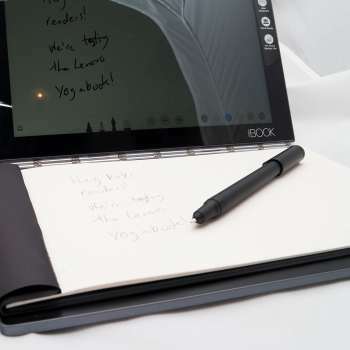 When you press down the pen button on the keyboard, the light-up keys power down and the pen software kicks in, allowing the Yoga Book to talk to the pen, so to speak. From here, you have two ways to write and draw, and these are dependent on what you want to do with your pen. 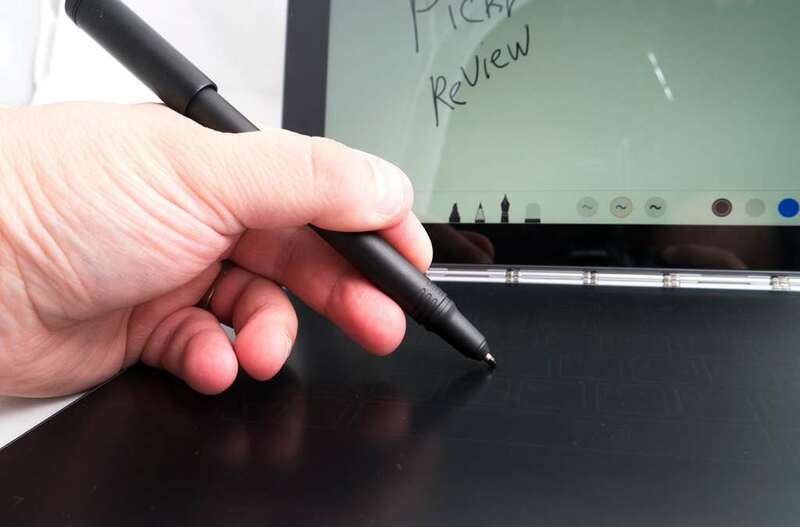 If you just want to watch the screen as you write, you can use the pen as a stylus, writing on the place where the keyboard once was, watching your letters and scribbles appear on the screen relative to where the screen is. Easy. 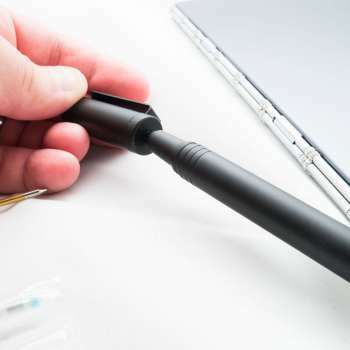 The other option is to replace the stylus tip with a pen tip, which is easy enough to do: just take the cap off the pen, lean the pen tip into the hole at the top of the pen lid, and pull the pen cartridge out. From there, you can replace it with one of the included proper ink pen cartridges, and voilà, your stylus is now a pen. 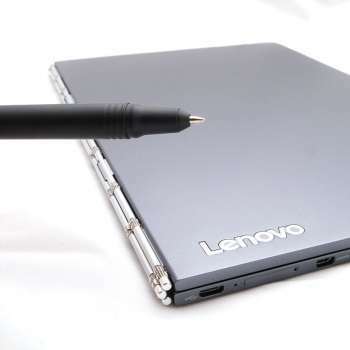 And thanks to how Lenovo has set this pen up, you can actually grab a sheet or two of paper, place it over the capacitive keyboard, and just scribble away, with the pen strokes being interpreted on screen like they would on a stylus. This is similar to what modern Livescribe pens do, but whereas they let you do this anywhere provided you’re using the Livescribe dot-paper, you have to write on the Yoga Book’s capacitive touchpad section where the keys normally light up, and you can’t type while this is on (not just because there’s a sheet of paper obscuring the keyboard, but because it only does one thing at once: keyboard or pen). 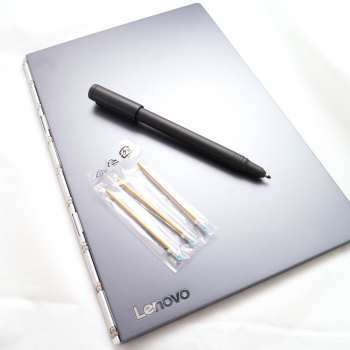 Lenovo does include the pen tip cartridges in the box, and it even includes a pad sized just for the tablet, so at least the company is catering for your needs, but you can bring your own paper if need be, and provided you use the side of the Yoga Book that doesn’t have a screen, you should be fine. The least integrated part of the package is probably the screen, simply because it uses a completely different technology if you want to write directly onto this element. Forget the stylus here that it comes with, as it just won’t work. Your fingers will, but that should come as no surprise to anyone who has ever used a tablet before, and is merely just how capacitive touch normally works. 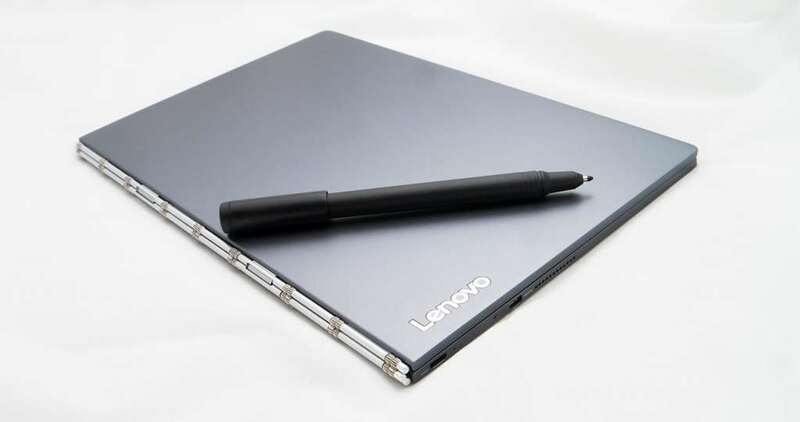 Lenovo increases the use in this regard by letting you use any type of pen you want thanks to its “AnyPen”, but really this is just as a replacement for your finger, because while the actual pen it comes with offers a degree of pressure sensitivity — 2048 degrees, that is — the screen does not. Fortunately, the screen is bright, vibrant, and very easy on the eyes, and while it’s not one of the BAM!-super-impressive ultra high resolution displays you can find on other tablets today, the 1920×1200 Full HD screen is definitely good enough for most. 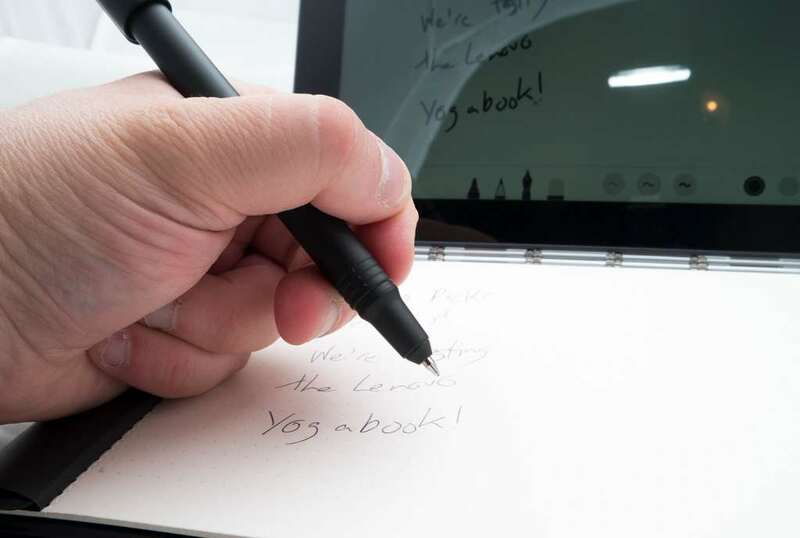 One of the last areas worth evaluating, we found the battery on the Lenovo Yoga Book was reasonable, and while the expectation is a life of around 15 hours, we found a day to two is possible dependent on how much you use the tablet. It does need to be noted, however, that even though the Yoga Book uses a microUSB port to charge from (yay! ), it really doesn’t want to take power from anything but its own charging block. You can plug it into any other microUSB charger you may have around your home — and if you’ve owned a few tablets or mobile phones, you will have amassed quite a collection — but the Yoga Book really wants the high voltage block it uses. Anything else and it will just take days to charge from zero up to 100 percent. 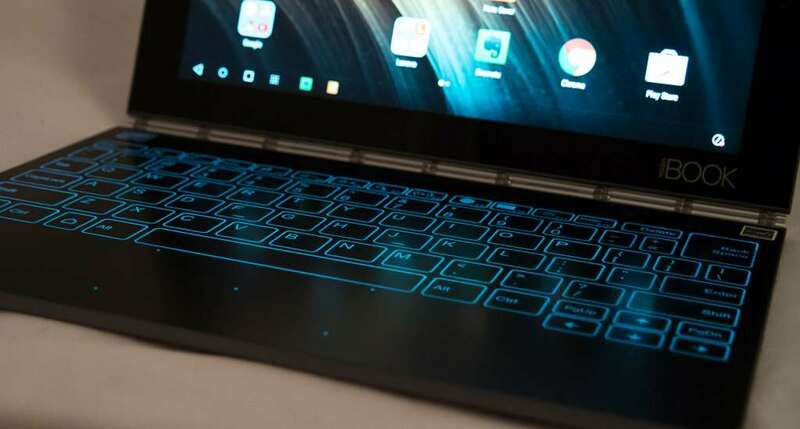 When we first saw Lenovo’s YogaBook back in September at the IFA show in Berlin, there was excitement: here we had a potential game changer delivering a new keyboard experience that does something more. We’ve seen this dual input idea executed in different gadgets before, with touch keyboards in a couple of tablets and laptops, while the pen interface has arrived on tablets and tablet accessories, but never before have they been merged. Perhaps that’s because the technology hasn’t been there, or perhaps it’s because the idea hasn’t been thought of in this way. Now, however, we have the two, and it’s exciting to see what can be done when the tablet and laptop are treated as one. That said, as exciting as it is, the execution can come across a little flawed, making the Yoga Book beautiful, but also beautifully flawed. It’s adaptive, sure, and that helps the keyboard to get over some of the niggles, but it’s not so adaptive that it’s easy for you to adapt to it, and when you buy a computer to type on, that can be a problem. The other issue Lenovo’s Yoga Book presents is one of accessorising, specifically because while you can add a different keyboard with other tablets, taking it off if you don’t like the feel, you can’t with the Yoga Book. This thing is held in place, and is part and parcel with the design. In a future variant, it might make more sense to to be able to use magnets and snap the screen from the special hinge and capacitive keyboard section, because that screen is lovely and the hardware stack is impressive, too, and if you could just move it around and decide whether you needed a super slim tablet without a mediocre touch-keyboard, that would be nice, and certainly more usable. Imagine if you could replace the keyboard with something a little thicker and offering one of Lenovo’s otherwise excellent ThinkPad physical keyboards. Wouldn’t that be something? Unfortunately you can’t do anything like that in this first model, but we hope it’s considered. Perhaps in the second generation, Lenovo will nail the formula. Right now, it’s more for the special buyer who values thin over everything. Apple’s Nike Watch is out shortly, so what do regular Watch owners miss?